The last official Israel Police estimate regarding the number of participants in the levaya of Mir Rosh Yeshiva HaGaon HaRav Nosson Tzvi Finkel at 4:00pm Israel time spoke of “tens of thousands”. Chareidi news services are reporting upwards of 100,000 people. Words including “Like Mama Rochel, who sacrificed for others, for the Klal, for Klal Yisrael” were heard among the maspedim. Leading the procession in the name of Kovod HaTorah was Posek HaDor Maran HaGaon HaRav Yosef Sholom Elyashiv Shlita and Maran HaRosh Yeshiva HaGaon HaRav Aaron Yehuda Leib Shteinman Shlita. Gedolei yisrael, roshei yeshiva and admorim were visibly moved at the levaya, painfully aware of the great loss to Klal Yisrael. Beginning with the early morning hours, after the news of the rosh yeshiva’s petira spread, people began making their way to the Beis Yisrael neighborhood of Yerushalayim, heading to the Mir, wishing to be close by, to share in the pain, to recite tehillim, to be part of this event as the klal attempted to comprehend the magnitude of the numbing announcement, that HaGaon HaRav Nosson Tzvi Finkel ZT”L is no longer among us. The first hesped was given by HaGaon HaRav Shteinman Shlita, who announced the that the Rosh Yeshiva’s son; HaRav Lazer Yehuda would fill in as the new rosh yeshiva. There was tehillim which were recited in pained choked voices, including that of the rav’s longtime chavrusa, HaGaon HaRav Yaakov Bornstein, Rosh Yeshiva Kiryat Melech. HaGaon HaRav Aryeh Finkel, Rosh Yeshiva Mir Brechfeld spoke in a broken voice of how his father molded his ruchniyus and his mother concerned herself with the gashmiyus. “The Aron Kodesh has been broken, one that was large and full of a love of Torah”. HaGaon HaRav Rafael Shmulevitz, one of the roshei yeshiva was also maspid the rosh yeshiva, speaking of the loss of the Prince of Torah, asking mechila on behalf of all the bnei yeshiva that failed to accord the proper respect. HaGaon HaRav Gedalia Finkel, a brother, spoke with a broken heart – having merited such a brother in his lifetime. The eldest son, the new rosh yeshiva, HaGaon HaRav Eliezer Yehuda added “you were an abba of thousands. You were a strength and force that transcends the natural. You did not have a body, not a image of a body, all was holy. “He was a model the epitome of modesty and everything he gave to others. Once I was asked to speak at a kenos addressing loshon hora and Abba told me ‘just three words – Love your neighbor as yourself (‘ואהבת לרעך כמוך’). How could one speak about another? This was his life’s mission. “He dwelled in Torah his entire life and learned how to demand from us, to compel us to reach greater heights. “May Hashem grant strength to great ima, a majestic ima, to grandmother, the mother of the Rosh Yeshiva, the wife of HaGaon Reb Beinish zt”l. “Oy Tata ascend to the Holy Throne – tear through the Heavenly Gate that Hashem will finally say enough tzoros for us and may he rebuild the Beis HaMikdosh speedily in our days. “In the name of the family and the kollel, with such traits as yours, you undoubtedly forgive us and will act as advocate (meilitz yosher) for us all”. A son, Rav Shmuel was maspid saying “You were an abba of the entire Torah world. Abba was rosh yeshiva of 3,000 talmidim. Who loved everyone of them and knew each by name. “Your mesirus nefesh in disseminating Torah and love of Torah all the time – this was indeed a rarity. He was closed in the room learning and relearning and continuing until 2:00am. At 4:00am he would also learn with the young bochrim. On erev Shabbos until candle lighting he sat and learned. May each of us take something from his example and strengthen ourselves, and may you be an advocate (meilitz yosher) for us all”. 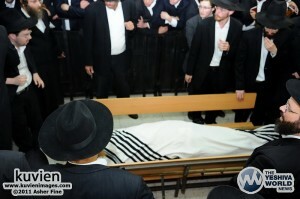 His son-in-law HaGaon Rav Noam Alon, a rosh yeshiva in Mir Brechfeld closed the hespeidim. After the mourners recited Kaddish the levaya began making its way to Har Menuchos via Meah Shearim Street to Sarei Yisrael Street. This is so sad. What a tremendous loss for all of us. It was such a kiddush Hashem to see tens of thousands escorting one of the gedolei hador – who will surely be missed by all – to his final resting place. People from all walks of life showed up. Perhaps we should take on something small – even just a one time thing (e.g. say the first bracha of bentching/ shemona esrei from a siddur – one time) to give us all a spark of kedusha – being that we lost a torch. katzleib – can you please explain your post? i don’t understand. Bichadrei has a working relationship with YWN. That is amazing. I am just an idiot who never knew that and like to publish anonymous comments trying to make people look like fools. Truth is, I have no clue what kind of relationship YWN has Bichadrei. Again, I’m sorry for all the comments people, I am really in pain today. Once a comment is submitted, YWN can do anything they please with my comment. If I don’t like it, I can go wherever I want and post comments. Please forgive me for my comments. The loss of Rav Finkel, Z’tl, is truly painful to many in the Mir kehillah and in the frum community generally. I’m not sure why you are being so cynical and sarcastic about his petirah but I can assure you he was regarded by many as a big tzadik and talmid chacham who will be greatly missed.